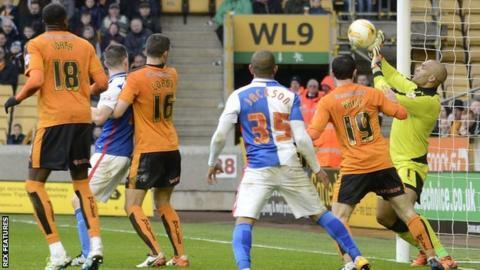 Keeper Carl Ikeme helped extend Wolves' unbeaten run to six games as he pulled off three stunning saves to frustrate Blackburn in a goalless draw. Ikeme twice denied Jordi Gomez and also prevented Shane Duffy from scoring as the hosts struggled at the other end. Their first attempt on target came after 76 minutes through substitute Bjorn Sigurdarson's shot. The stalemate was the third in a row at Molineux, the first time that has happened to Wolves since 1899. Blackburn lost striker Danny Graham early on when he limped off with what appeared to be a hamstring injury. Ikeme's first superb save came just before half-time when he pushed away Gomez's 25-yard strike. He then turned a late Gomez header over the bar before denying Duffy in similar fashion from close range. "It is six games unbeaten but it doesn't feel like six games unbeaten. "I thought that we had the better of Blackburn and we were on top. But it was difficult for us to go and create and go past people in one-v-one situations. "We had excellent performances in midfield and we got the ball into wide areas but from there it was tough for us." "Their goalkeeper has kept them in the game with three world-class saves. It is disappointing not to win the game as I thought we had the better chances. "To come here and Jason (Steele, goalkeeper) not to make a save speaks volumes for the defence. "It was a nothing game really but we had the better chances and I thought we should have won it at the end." Chris Brown (Blackburn Rovers) wins a free kick in the attacking half. Attempt blocked. Conor Coady (Wolverhampton Wanderers) right footed shot from outside the box is blocked. Assisted by Bright Enobakhare. Attempt blocked. Shane Duffy (Blackburn Rovers) right footed shot from the centre of the box is blocked. Corner, Blackburn Rovers. Conceded by Carl Ikeme. Attempt saved. Shane Duffy (Blackburn Rovers) header from the left side of the six yard box is saved in the top left corner. Assisted by Elliott Bennett with a cross. Attempt saved. Jordi Gómez (Blackburn Rovers) header from the centre of the box is saved in the top centre of the goal. Assisted by Jason Lowe with a cross. Attempt missed. Connor Hunte (Wolverhampton Wanderers) header from the centre of the box misses to the left. Assisted by James Henry with a cross following a set piece situation. Björn Sigurdarson (Wolverhampton Wanderers) wins a free kick on the right wing. Simeon Jackson (Blackburn Rovers) wins a free kick on the right wing. Connor Hunte (Wolverhampton Wanderers) wins a free kick in the defensive half. Attempt saved. Björn Sigurdarson (Wolverhampton Wanderers) left footed shot from outside the box is saved in the centre of the goal. Substitution, Wolverhampton Wanderers. Björn Sigurdarson replaces Adam Le Fondre. Dominic Iorfa (Wolverhampton Wanderers) is shown the yellow card for a bad foul. Corner, Wolverhampton Wanderers. Conceded by Ben Marshall. Substitution, Blackburn Rovers. Simeon Jackson replaces Matt Grimes. Bright Enobakhare (Wolverhampton Wanderers) wins a free kick on the right wing. Matt Grimes (Blackburn Rovers) is shown the yellow card for a bad foul. Bright Enobakhare (Wolverhampton Wanderers) wins a free kick in the defensive half. Substitution, Wolverhampton Wanderers. Connor Hunte replaces George Saville.